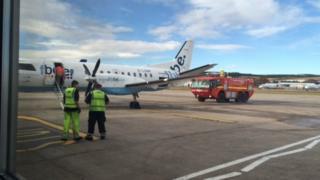 A Loganair flight from Edinburgh to Orkney was diverted to Aberdeen after declaring a mid-air emergency. The Orkney MSP Liam McArthur was on the Kirkwall-bound flight, which landed safely at Aberdeen International Airport at about 10:45 on Friday. He told BBC Scotland that the crew informed passengers that there were fumes in the cockpit, but passengers were unaware of any fumes in the cabin. There were 24 people on board at the time. Mr McArthur told BBC Scotland: "It was obvious that the plane was in descent and the pilot came over the intercom and informed us there was a smell of fumes in the cabin area and they were getting stronger not weaker. "Slightly concerning for everybody. Everybody was certainly very calm." A spokesperson for Loganair said: "The captain of Flight BE6891, which departed Edinburgh International Airport at 09:25 this morning for Kirkwall with 20 passengers, one infant and three crew on board, elected to divert to Aberdeen as a precautionary measure after detecting an unusual smell in the cockpit. "The safety of its passengers and crew is the airline's number one priority and the plane landed safely at 10:45 without further incident. "The passengers disembarked as normal when the aircraft arrived on stand. As is normal in such circumstances, the airport placed its emergency vehicles on standby. "Loganair apologises for any inconvenience experienced by its passengers who are all now continuing their journey on another aircraft."